Charlottesville, VA -- The Festy Experience is excited to announce the first half of its music lineup for the 8th annual festival, happening October 5-8, 2017 in the Blue Ridge Bowl at Infinity Downs Farm in Arrington, Virginia. The lineup comprises a carefully curated blend of national and local roots music acts, featuring The Infamous Stringdusters, Drive-By Truckers, Sam Bush Band, The Travelin' McCourys, The Jerry Douglas Band, Cabinet, Billy Strings, Love Canon, Carl Anderson, and The 8th Annual Garrettgrass Gospel Hour. And this is just half of the artist lineup. The next installment of artists will be announced on Wednesday, June 14th. Tickets are on-sale now. Trey Anastasio Band, Gov’t Mule, Bela Fleck, Leftover Salmon, Hot Rize, and The Infamous Stringdusters are just a few of the fantastic acts coming to the family reunion in Cumberland for the 10th Annual DelFest. Teen, Kids, On-site RV, Dry RV, Vehicle, and DELuxe packages went on sale Tuesday, January 10th so hurry while they're still available. This 10th Anniversary event takes place May 25-28 in Cumberland, Marylannd. On Oct. 29, 2016 - Bluegrass Underground is proud to present a day-long celebration of bluegrass and roots music by some of the best in the business. The first show starts at 1pm featuring two giants of American music, David Grisman & Del McCoury as Del & Dawg. The Travelin' McCourys are proud to announce " Tour" with Jeff Austin Band! After the success of the inaugural Grateful Ball in St. Louis, the bands decided to make a tour out of it! The ball consists of a full set from each band and then a set with both bands on stage together playing the songs of the Grateful Dead. The Travelin’ McCourys do not stand still. They are on the road—and online—entertaining audiences with live shows that include some of the best musicians and singers from all genres. It’s always different, always exciting, and always great music. The Travelin' McCourys are known for their branding of the term 'Bluegrass Ball'. If ever there was a group of shows that defined this term, it was this past weekend on the Front Range of Colorado. The Bluegrass Ball shows, Thursday in Ft. Collins at The Aggie and Friday & Saturday in Denver at Cervante's, were slated to include Bill Nershi of String Cheese Incident and Anders Beck of Greensky Bluegrass at all three shows with special guest, Del McCoury on Saturday. Acclaimed band, The Travelin’ McCourys have started a new chapter in their book with the announcement that their guitar chair will be permanently filled by long-time friend and fan favorite, Cody Kilby. It’s a fitting call, given that Kilby — a veteran of the national bluegrass scene since appearing on the IBMA Awards Show in 1993 as a member of the Bluegrass Youth All-Stars with fellow teenagers like Chris Thile — was the guitarist on the Travelin’ McCourys debut appearance at the Wintergrass festival. Since then, a distinguished and varied group of guests have toured with the McCourys— the list ranges from bluegrass stalwarts like Jeff White and Ronnie Bowman to edgier pals like Keller Williams, The Infamous Stringdusters' Andy Falco, and String Cheese Incident’s Billy Nershi — with Kilby enjoying the role of most frequent. Prior to today’s announcement, Kilby spent 14 years as a member of Ricky Skaggs’ award-winning Kentucky Thunder and as a sought-after studio player, most recently on Beck’s Grammy winner, Morning Phase. Vail, CO -- As previously announced, the Arrabelle at Vail Square will play host to the inaugural free Vail Summer Bluegrass Series featuring notable bluegrass talent; the Travelin’ McCourys ft. Bill Nershi (String Cheese Incident) - July 2, Peter Rowan’s Bluegrass Band - July 16, Sarah Jarosz - August 13 and the Drew Emmitt Band (Leftover Salmon) - August 27. Vail, CO -- Vail Bluegrass announces the lineup for its inaugural series to be held on Wednesdays, July 2, July 16, August 13 and August 27 beginning at 6:00 p.m. at the Arrabelle at Vail Square. The Vail Summer Bluegrass Series is a free event with the option to purchase tickets for preferred seating. Tickets for preferred seating will go on sale Tuesday, April 1 on the website. Bristol, TN/VA -- It is that time of the year again and everybody is getting ready for the music event of the Tri-Cities region -- The Bristol Rhythm & Roots Reunion. Lucinda Williams, The Masters of Bluegrass, Blitzen Trapper, Deer Tick, Keller Williams, Colin Hay, Iris Dement, Hayes Carll, J.D. McPherson, Red Molly, Scythian and many more will be performing. Many bluegrass music favorites will also be performing including The Travelin' McCourys, IIIrd Tyme Out, Claire Lynch Band, Dale Ann Bradley, Donna Ulisse, and a whole lot more. Bristol, TN/VA is not only a good place to live, its a great place to listen to your favorite artists performing live. Bristol, TN/VA -- The 13th annual Bristol Rhythm and Roots Reunion returns to historic downtown Bristol, Sept. 20-22, with appoximately 150 artists scheduled to take part, headlined by Lucinda Williams, Keller Williams, Masters of Bluegrass, Deer Tick and Blitzen Trapper. Many bluegrass music favorites will also be performing including The Travelin' McCourys, IIIrd Tyme Out, Claire Lynch Band, Dale Ann Bradley, Donna Ulisse, and a whole lot more. Bristol, TN/VA is not only a good place to live, its a great place to listen to your favorite artists performing live. The Emelin theatre in Mamaroneck, New York will feature the wonderful bluegrass music group The Travelin McCourys Friday, May 17 at 8 PM. This show is dedicated to the memory of Bob Mavian. Over the years, Bob and his wife Barbara graciously opened their home to a number of bands who played at the Emelin. Bob himself was well-known in the bluegrass community as an outstanding musician, especially on mandolin and banjo. He appeared with his band, Horse Country, at some of the very first bluegrass shows that Doug Tuchman and J.Jay Mautner produced at the Emelin, and thereafter was at the Emelin with several different bands including the Case Brothers and Big Apple'achia. Bob was exceptionally knowledgeable about vintage bluegrass instruments, and when he played, the four "T's," as bluegrass pickers like to say, were all there: touch, tone, timing and taste. He was a friend and mentor to countless bluegrass musicians, and he will be missed by everyone who knew him. The Theatre is located at 153 Library Lane in Mamaroneck. Tickets are $15 Students; $44 Advanced; $47 Day of Show. After a hugely successful first year, Cloud 9 Adventures today announces the second installment of Strings & Sol, the newest music destination event in the Cloud 9 family, which also includes Mayan Holidaze, Jam Cruise, Holy Ship! and Panic en la Playa. Strings & Sol - set on the white sand beaches of Puerto Morelos on the Riviera Maya, Mexico - runs December 11 - 15, 2013. This unique adventure brings together some of today’s best progressive bluegrass bands for a rollicking string-music vacation like no other. Legendary bluegrass artists Peter Rowan, Tony Rice and The Travelin' McCourys pay homage to the undisputed “Father of Bluegrass” Bill Monroe. 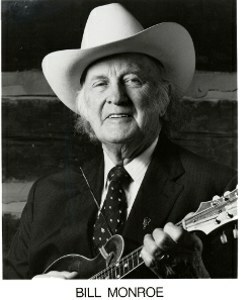 Few artists can claim to have created a genre all their own, but Kentucky-born musician Bill Monroe (Sep. 13, 1911 – Sep. 9, 1996) did exactly that when he added North Carolina banjo prodigy Earl Scruggs to his traditional stringband in 1945. Known as the Blue Grass Boys, Monroe and Scruggs, alongside singer/guitarist Lester Flatt, fiddler Chubby Wise and bassist Howard Watts, forged new ground, not only creating an entirely unique genre of American music, but forever changing the course of American rock-and-roll with one of their most famous songs, “Blue Moon of Kentucky” - an early hit for an up-and-coming young musician named Elvis Presley. Live Oak, FL -- Known for consistently booking some of the finest performers in new and traditional folk, roots rock, bluegrass and newgrass, and other American roots music, Suwannee Springfest returns in 2013 for its 17th straight year. Suwannee Springest will be held March 21-24, 2013 at the Spirit of the Suwannee Music Park in Live Oak, Florida and features some of the biggest names in the scene with veterans and up-and-comers alike. Peter Rowan, Keller and the Keels, Leftover Salmon, Donna the Buffalo, The Travelin' McCourys, Jim Lauderdale, The Mosier brothers, Elephant Revival, Red Baraat, Spirit Family Reunion, Shane Pruitt Band, Applebutter Express, Grandpa's Cough Medicine, the Weatherman, and more. Many artists will be performing multiple sets too. Wilmington, NC -- Legendary bluegrass masters Peter Rowan, Tony Rice and The Travelin' McCourys pay homage to the undisputed "Father of Bluegrass" Bill Monroe. Few artists can claim to have created a genre all their own, but Kentucky-born musician Bill Monroe (Sep. 13, 1911 – Sep. 9, 1996) did exactly that when he added North Carolina banjo prodigy Earl Scruggs to his traditional stringband in 1945. Known as the Blue Grass Boys, Monroe and Scruggs, alongside singer/guitarist Lester Flatt, fiddler Chubby Wise and bassist Howard Watts, forged new ground, not only creating an entirely unique genre of American music, but forever changing the course of American rock-and-roll with one of their most famous songs, "Blue Moon of Kentucky" - an early hit for an up-and-coming young musician named Elvis Presley.